Trigger fed for optimal glue flow. 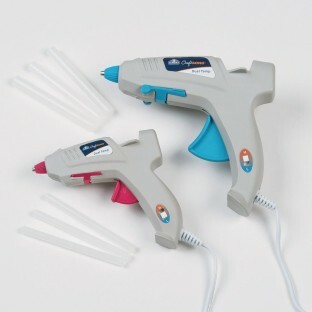 Elmer's CraftBOND™ Mini size dual temperature glue gun. Trigger fed for optimal glue flow. Enhanced safety features include insulated nozzle to safeguard against burns, auto-shut off if gun overheats, side lifts allow gun to rest safely on its side preventing glue back-up. Dual temp for optimal performance on all craft materials - use high temp setting for wood, plastic, leather. Use Low temp setting for more delicate materials like foam. Measures 20”W.